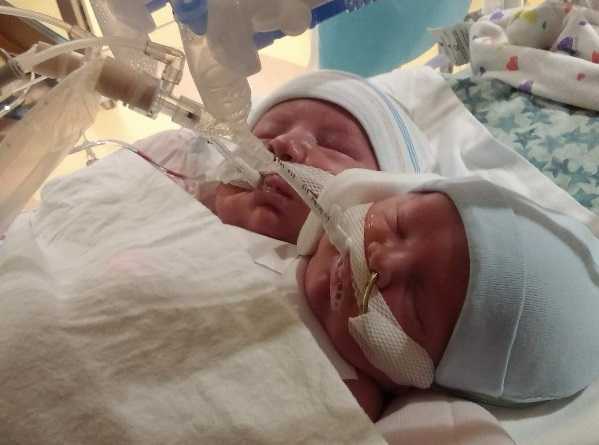 WINSTON-SALEM, N.C. — A North Carolina couple that was advised to abort after learning that their unborn twin sons were conjoined at the chest is celebrating the birth of their boys, named Isaac and Elijah. Kroeger and his wife, Heather, learned earlier this year that they were expecting and were provided with a due date of Oct. 1. At first, it was thought that the couple was expecting just one baby. However, during another ultrasound at the end of the first trimester, the Kroegers were informed that there were twins in Heather’s womb, which appeared to be conjoined. It was recommended that couple obtain an abortion, but they refused. Caring for the twins meant that the couple needed to travel to the Cincinnati Children’s Hospital Medical Center in Ohio, as other locations were not equipped to handle the situation. On Sept. 5, the boys were born, and are stated to be doing better than expected. Doctors have since determined that Isaac and Elijah will not be able to be separated because they share too many vital organs, but the twins did recently have some sort of operation, according to a GoFundMe page set up for the couple. “They are alert and make all the beautiful faces and sounds that newborns do: hiccups, grins, eyes following voices and even cries when they don’t appreciate the medical team caring for them. They love being held and are just so calm,” the page reads. The babies are further believed to be a miracle, as an estimated 40 to 60 percent of conjoined twins are stillborn, and another 35 percent survive just one day, according to the University of Maryland Medical Center. Friends of the Kroegers have raised over $18,000 for the twins’ medical expenses. The Kroegers have five other children, ages 17 to 4.